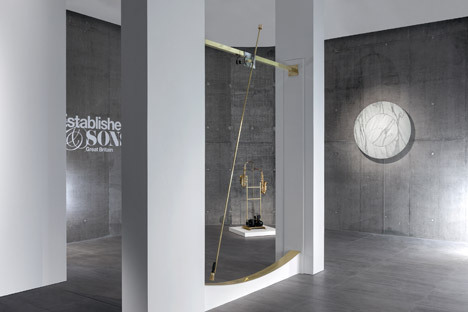 Andrea Trimarchi and Simone Farresin of Formafantasma created the time-themed installation, titled From Then On, to mark Established & Sons' tenth anniversary. "From Then On was an ambitious proposal from a design studio I greatly admire," said Established & Sons CEO Maurizio Mussati. "We made a joint decision to look at the passing of time, with our tenth anniversary approaching." Each of the clocks by the duo marks the passing of time using the qualities of a different material. The first is made from a disk of white Carrara marble, split into a central circular section and a surrounding ring. The clock shows the passing of an hour using a prominent vein running through the centre of the face, which rotates 360 degrees over 60 minutes to align on the hour. Another piece comprises two saxophones hooked up to a frame, programmed to sound every 15 minutes to "announce and celebrate the experience of daily life as it evolves". A fan that opens around a brass disk gradually unfolds over the space of five minutes, forming a full circle before snapping back shut. The final clock comprises a long brass rod with a small brush on its end, hung from a horizontal beam. The pole swings like a pendulum so the bristles sweep back and forth over a curved brass strip every second, polishing the material bit by bit to prevent oxidisation.